Your home is a medium through you are free to express your personality. While each of the four walls in any room of your home serving as a window into the soul, there are even more design possibilities underfoot. Flooring doesn’t just have to be a place for furniture. The floor is the foundation of your room and it can also be used as the foundation of any well-planned interior design scheme. Create a truly polished look that will continue to offer years of beauty with long-lasting tile flooring. Creating the perfect design for any room starts from the floor up. Your proverbial fifth wall is one of the first things that guests and visitors notice when entering your home. With tile floor, you can add a new, durable surface to your home that perfectly matches your sense of style and sets the tone for the rest of your décor. At our fully stocked flooring store, our sensible design experts are committed to helping you choose the perfect selection to create your dream retreat. We have a variety of slate, porcelain, and ceramic tile to choose from. Once you’ve chosen your new flooring, our trained tile flooring installation professionals work with you to complete your home renovation project according to your schedule and budget. Due to the amount time spent in and around your household, you deserve to make your space look inviting rather than a place that you simply reside. We feel that no homeowner should be limited in a lasting choice like tile flooring. When you invest in flooring, our experts understand that you want to be completely confident in your decision. That’s why we provide our customers with an impressive selection of tiles, including luxurious ceramic and porcelain patterns. When you put your flooring project in the hands of our capable team, we don’t rest until your every need is satisfied. Backed by our wear, fade, and stain warranties, your one-of-a-kind flooring can last up to 25 years with minimal maintenance. If you are in the market for new tile flooring, one of our professional associates can help educate you about our many options for any room in your home. Our commitment to helping you make your dream floors a reality doesn't end after you've selected your tile. We are proud to offer professional tile floor installation as part of our comprehensive flooring service. You don’t have to schedule time off work or break out a tool kit to have your flooring redone when you put our skilled technicians on the job. It’s important to make sure your tile floor is installed by a skilled and qualified professional. Protect your investment by leaving the tough work to us. Tile flooring is especially difficult to install because each piece must be place precisely in order to avoid crooked tiles or misplaced mosaic pieces. When we arrive at your home, our team comes well-equipped with proper tools and specialized equipment necessary to deliver a clean installation. We work according to your needs, so you can be sure to get well-crafted flooring laid perfectly into place, no matter the size or shape of your space. You won't have to worry at all about your flooring project. We've got you covered from beginning to end. 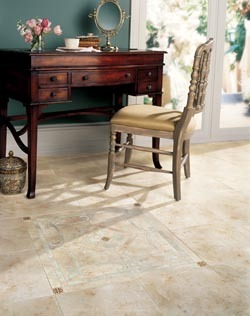 Due to our impressive buying power, you are sure to get your tile floor selections at a price you can appreciate. With an extensive network of locally owned flooring stores, we can offer some of the lowest prices on some of the most trusted types of discount tile flooring. Come to discuss your project with our specialists today and we will work with you to bring our remodeling visions to life right in your own home. Contact our specialists to learn more about luxurious tile flooring options available to you. We proudly serve customers in Flower Mound, Texas, as well as the surrounding areas.